Get ready for all the CUTE! It has reached the drawers already! Pastel shades for Eye Quads, Lipstick, Plushglass, and Nail Lacquer. Mineralize Blush with the sweet heart baked right into it...it’s completely, contagiously, cute! I have been waiting for this collection for so long! Since February, to be precise...hmph! 5 months is a long time & spring is gone. But never mind, coz pastels work in summers too. 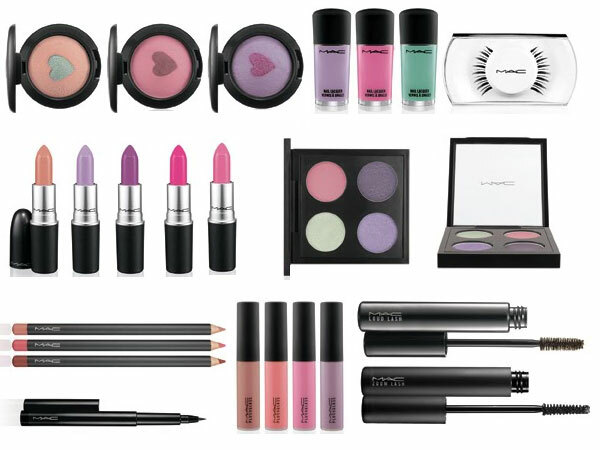 Anyways, MAC Quite Cute Collection will be launched on 9th July- this coming Saturday. Wheee....! So, what do you like most from this collection? It's really cute and girly. I love the colours. I think the colors and all look really cute, but theyr kind of all leaning on the cool side..i think it will be too pale for me though. I can totally see you rocking those kmineralized blushes with the centre heart....If only the heart was a bow..it would be tailor made for u haha! looks so yum! I definitely want the blush!!! I wanna buy some of those soon!!! Congrats on finally being able to get this collection! None of the colors appealed to me for myself but I'm interested to see them on you! I didn't like this collection. Eye shadow palette was hopless. eyeshadow texture was powdery, Only giggly blush was worth to try in this collection. how exciting! what are you most interested in? Pastels are not me so I didn't get anything, but it was all very cute! Hi, I came across your site while looking at lipsticks! I was wondering if you were part East Asian in any way? You are so pretty and you remind me of my friend who is half Chinese, half Indian. Thanks!